Lesson 13: “Journey To Rome"
Memory Text: “ ‘Do not be afraid, Paul; you must stand before Caesar’ ” (Acts 27:24, ESV). Lesson 12: “Confinement in Caesarea"
Memory Text: “ ‘Whether quickly or not, I pray to God that not only you but also all who are listening to me today might become such as I am—except for these chains’ ” (Acts 26:29, NRSV). Lesson 11: “Arrest in Jerusalem"
Memory Text: “The following night the Lord stood near Paul and said, ‘Take courage! As you have testified about me in Jerusalem, so you must also testify in Rome’ ” (Acts 23:11, NIV). Memory Text: “I do not count my life of any value to myself, if only I may finish my course and the ministry that I received from the Lord Jesus, to testify to the good news of God’s grace” (Acts 20:24, NRSV). Memory Text: “ ‘Do not be afraid; keep on speaking, do not be silent. For I am with you, and no one is going to attack and harm you, because I have many people in this city’ ” (Acts 18:9, 10, NIV). Next Week: “The Third Missionary Journey"
Memory Text: “ ‘We believe it is through the grace of our Lord Jesus that we are saved, just as they are’ ” (Acts 15:11, NIV). Memory Text: ‘Therefore, my friends, I want you to know that through Jesus the forgiveness of sins is proclaimed to you. Through him everyone who believes is set free from every sin, a justification you were not able to obtain under the law of Moses’ ” (Acts 13:38, 39, NIV). Memory Text: “Then Peter began to speak to them: ‘I truly understand that God shows no partiality, but in every nation anyone who fears him and does what is right is acceptable to him’ ” (Acts 10:34, 35, NRSV). Memory Text: “ ‘Go! This man is my chosen instrument to proclaim my name to the Gentiles and their kings and to the people of Israel’ ” (Acts 9:15, NIV). Memory Text: “The word of God continued to spread; the number of the disciples increased greatly in Jerusalem, and a great many of the priests became obedient to the faith” (Acts 6:7, NRSV). Memory Text: “Every day they continued to meet together in the temple courts. They broke bread in their homes and ate together with glad and sincere hearts, praising God and enjoying the favor of all the people” (Acts 2:46, 47, NIV). Memory Text: “This Jesus God raised up, and of that all of us are witnesses. Being therefore exalted at the right hand of God, and having received from the Father the promise of the Holy Spirit, he has poured out this that you both see and hear” (Acts 2:32, 33, NRSV). Lesson 1: “You Will Be My Witnesses"
Memory Text: “You will receive power when the Holy Spirit has come upon you; and you will be my witnesses in Jerusalem, in all Judea and Samaria, and to the ends of the earth” (Acts 1:8, NRSV). 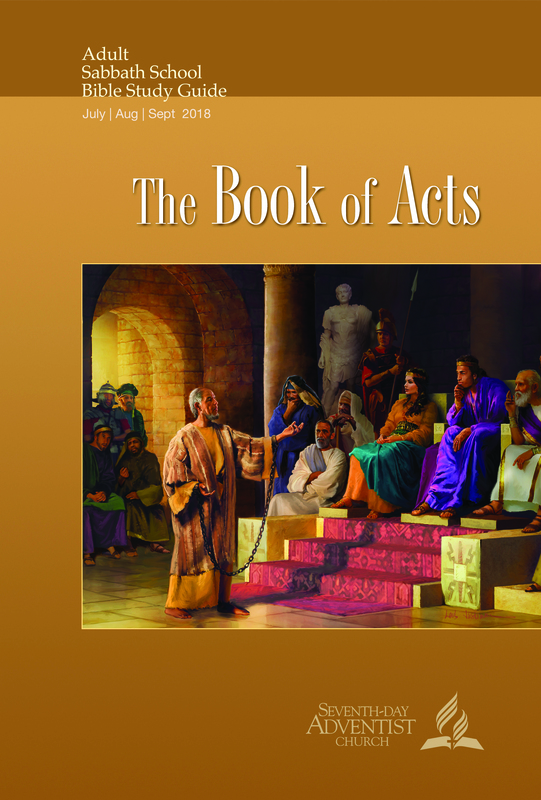 Download or view online the latest quarterly from the Adult Bible Study Guide website.